It is to nature lovers that I am addressing today because we will be inspired by plants in order to develop our passions and skills. It is common to have good resolutions about habits you would like to take or change, but very often, we abandon them after a few weeks, days, or even hours… What method should you use to include your good resolutions in your daily routine and thus develop good habits? This is where the plants come in and I propose you a 3-step method. First, make a list of the habits or skills you would like to develop. I suggest that you start with a small number and then increase it once the first ones are in place. For example, it could be: “doing an activity once a week with my mother, painting and learning Spanish”. Once your list is complete, I suggest you buy a plant corresponding to each of your skills or habits to develop. 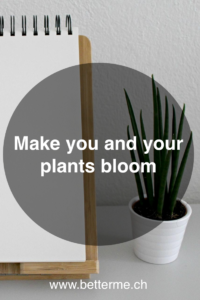 Choose beautiful plants that stand out from each other and place them in a prominent place in your home. You will then note on the pot of each one the habit to which it corresponds. Finally, you will write a solemn oath stating that you will do everything in your power not to kill this plant. Place this oath next to your plants in a clearly visible place. You will have guessed it, from now on the principle is simple: each time you water one of your plants, you will have to work on the habit or skill to which it corresponds. To increase your involvement in this process, it is important to respect this mechanism in both directions: if you have not worked your habit, you are not allowed to water your plant. Thus, the vision of the plant declining due to lack of water and the reminder of the vision of your written oath will encourage you to develop your skill so as not to make it die. The best thing to do would be to match your plant’s water needs with the frequency with which you want to develop your habit. Choose a plant that requires a lot of water for an activity you want to do regularly and take plants that require less maintenance for less regular habits. Linking your resolutions to the responsibility of maintaining a living organism will increase your involvement in the practice of your habits and skills. In addition, the satisfaction of seeing your home decorated with lush plants and knowing that their growth is associated with the efforts you have made to develop new skills will become a great source of appreciation.